Forty-inch LED light bars are a great choice when seeking extreme illumination and a lower price compared to a full-size 50-inch model. Most manufacturers offer this size, so you have a wide array of lighting capabilities, LED configurations, beam patterns and prices from which to select. Although most buyers mount a 40-inch light bar overhead above the windshield, on a rack or on the roof, this size fits well in grills and below the bumper too. They make an outstanding scene illumination light for emergency or public service vehicles as well. Black Oak’s 40 inch LED light bar features a dual-row configuration of 80 3W or 5W super-efficient and long-lasting OSRAM LEDs. The 5W version delivers 44,000 raw lumens of murk-smashing ultra-bright light. Like all Black Oak LED light bars, it is built to withstand the roughest trail conditions, water, dust and ice. It comes with a complete wiring harness, brackets and a lifetime warranty. This light comes in a curved housing as well. 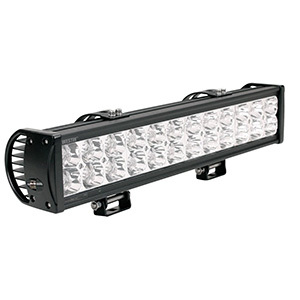 This is Black Oak’s second biggest dual-row light bar. Its length complements smaller cars, while sacrificing little in brightness. It boasts a phenomenal IP69K rating against submersion, heavy dust or deep snow. 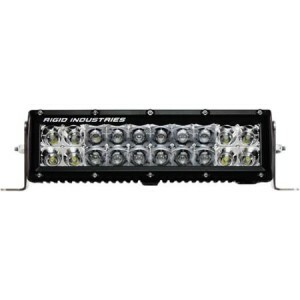 It is a favorite of heavy equipment operators and public service vehicles for forward, rear and side illumination. 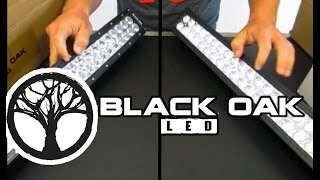 Black Oak LED light bars are long on performance and economy. Their 40-inch dual-row light performs and lasts as well as higher-end competing LED light bars that cost 50 percent more. 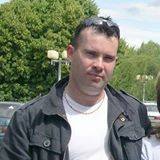 As such, they represent the highest value in high-quality LED light bars. Vision X’s 40 inch LED light bar delivers a stunning 38,000 raw lumens of light with either 10-degree or 40-degree beam configurations. It features 72 5W top-bin LEDs in two rows and Vision X’s Prime Drive technology to control temperature and extend LED life. The heavy-duty aluminum housing, shatterproof lens and custom seals withstand the harshest environments including racing and industrial applications. Vision X’s pulse-width-modulation circuitry turns the LEDs on and off at invisible speeds to optimize their operation. If you add a PWM controller, you can use PWM for a juice-saving light bar dimmer as well. 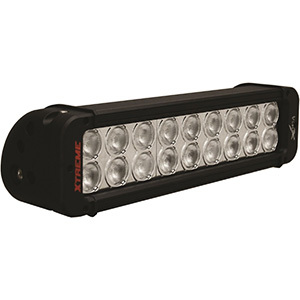 This 40-inch light bar is built to take a beating in off-road or roadwork applications, while providing industrial-strength brightness and reliability. 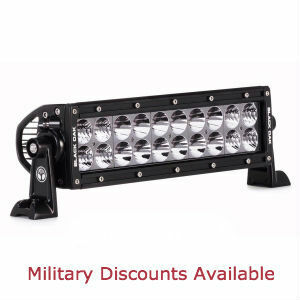 This wide, bright, dual-row LED light bar stands shoulder to shoulder with the best light bars in the world. It is built inside and out for top performance and a lifetime of operation. The 40-inch Xtreme from Vision X is built for serious buyers. Arsenal Offroad’s 40 inch LED light bar’s subtle curve adds style and more beam spread than ordinary roof-mounted light bars. 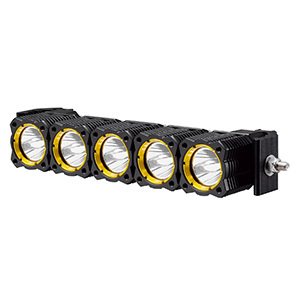 It uses 80 USA-made 3W CREE LEDs to produce a 19,200 raw lumen, 6000K beam in a spot, flood or combo pattern. In combo, 48 center LEDs provide a 30-degree spot, while 24 LEDs on each end deliver flood illumination. It has a respectable IP67 intrusion rating and 30,000 hour LED lifespan. If you want a big, bright light bar at an affordable price, the Arsenal Offroad 40 inch curved LED light bar was made for you. Its nearly 20,000 raw lumens handily beats out competing light bars in its price range. The 30-degree spot beam has ample darkness penetration too. It is rugged enough to stand up to harsh trails and weather. Arsenal’s 40-inch curved light bar has a great look and provides an ideal wide-width driving beam. It is nearly as bright as top-end light bars in this length, but comes at a fraction of the price of those. For the weekend warrior, this is a superb value. Tuff Stuff’s single-row light bar features a sleek, low-profile design that complements any vehicle’s contours. It features special no-vibration, sliding feet for mounting versatility. Over 10,000 raw lumens from 24 5W USA-made CREE LEDs in a 30/60-degree combination beam sear any surrounding gloom. The robust, IP67, die cast aluminum housing adds superb protection against environmental hazards. The kit includes a complete wiring harness. Tuff Stuff’s 40 inch LED light bar is popular with buyers who appreciate the additional mounting flexibility of the sliding feet compared to other brands’ end-cap brackets. This light bar is super bright and its combo beam is tuned perfectly for low- and high-speed driving situations. 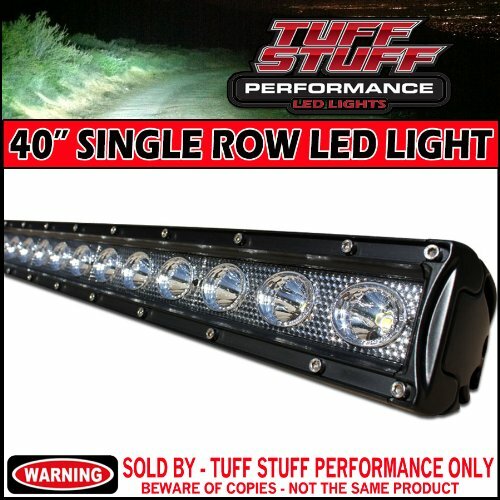 Tuff Stuff Performance has combined high-quality design and components to make an outstanding single-row 40-inch light bar that will endure all the rigors of the trail and harsh weather. Shop the price on this one as it often sells at healthy discounts. KC HiLites’ C-Series 40 inch LED light bar is the perfect balance of top performance and affordability. Its combination spot/flood beam pattern is one of the highest penetration beams in this category. This light craves extreme trail conditions with its extruded aluminum housing, shatterproof lens and IP67 rating. It comes with a complete wiring harness and clear or amber LEDs are available. The price of this 40-inch light bar from KC HiLites is not much lower than Black Oak’s 40-inch light bar, but it does offer a lower profile, a rugged build and high-performance LEDs. If you have other KC HiLites, then definitely you will want to stick to this brand. Rough Country’s premium quality curved 40-inch LED light bar is a cut above the rest. It utilizes 80, top-bin 3W Cree LEDs, a tight 10-degree center spot plus 60-degree flood beams for level, broad and void-free illumination. An additional 40 LEDs furnish a DRL strip for daytime driving. Housed in a sturdy die-cast aluminum housing with a PC cover and quality seals, it is rated IP67 for moisture and dust intrusion and outputs 21,600lm of white light. Most later model Dodge truck owners can mount this light seamlessly in the front bumper with Rough Country’s 70569 hidden bumper brackets. Rough Country receives rave buyer reviews for their rugged build, design and high performance light bars. This 40-inch curved light supports that reputation. The DRL function provides a unique look and additional safety. This is a premium light bar with one of the tightest, deep-reach spots offered in this light bar size. Well worth it when you consider the quality built into this flamethrower. It offers striking illumination power at 25000lm, a rugged housing and shatterproof PC lenses. Plus, it boasts a better-than-most IP68 rating. 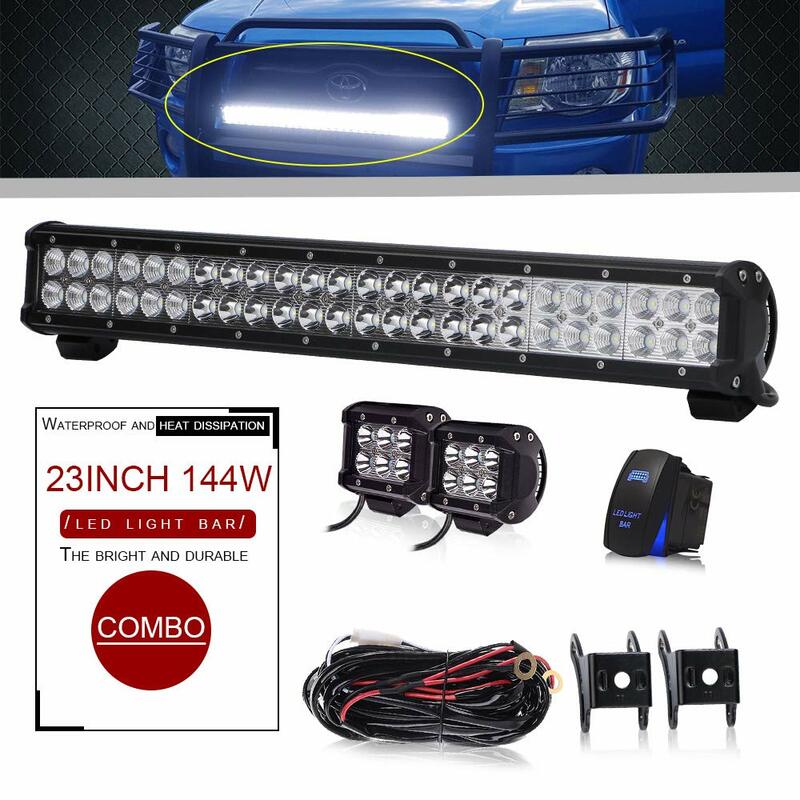 The design features are showy, but buyers also rave about this best 40-inch light bar’s brightness, solid construction and three color modes while shrugging off the lack of wiring harness or instructions. Must buy a wiring harness separately. Why not take a plunge on this innovatively designed LED light bar? Buy this light as a conversation starter and use it to efficiently slice through dark, foggy nights. 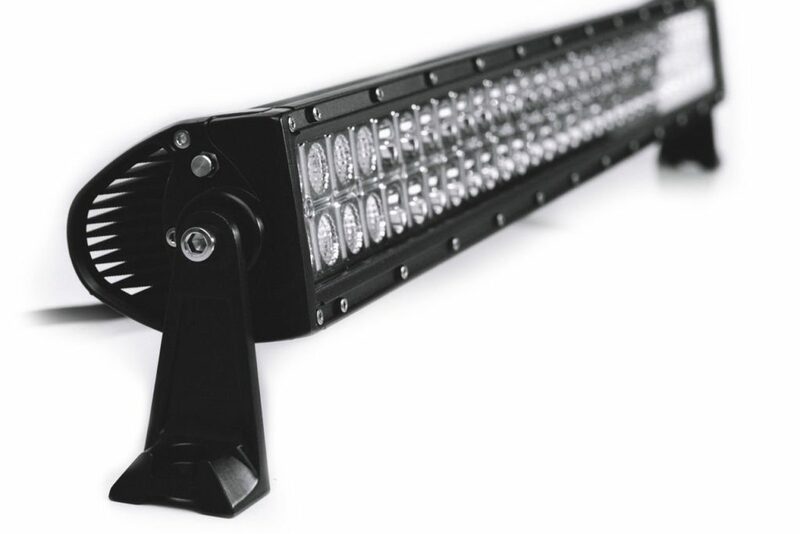 XS Performance LED make a range of quality dual-row combo beam light bars including this 40 incher. It sports a wide center spot beam with compact side floods for breadth and fill. The 16,800lm of 6000K light strips away the darkest night. A polycarbonate lens, 6063 aluminum, deeply-finned housing and quality seals add up to an IP67 waterproof rating. Buyers like that XS Performance LED makes straightforward, well-built LED light bars for an affordable price. They have fit this light to a variety of U.S. and foreign cars, 4x4s, ATVs and work equipment. When a 50-inch LED light bar is just too big, drop down to this 40-inch bar for a sure fit above the windshield, in the grill or bumper slot. Saber X blows away the competition with an outstandingly bright 40-Inch optics-enhanced curved light bar. For that price, you also get two six-LED pod lights and wiring harness with a lighted rocker switch. It hooks up to any vehicle or equipment with a 12V or 24V DC power source. Buyers’ 5-star ratings are the norm. They praise its ease of installation and lighting performance. The two fog pods and well-made wiring harness, including a relay and switch, are icing on the cake. This Saber X light lets you choose from three lighting levels to match the situation. It assembles and installs fast, so buy one now for an upcoming weekend of dark trail riding. If you are looking to maximize trail or road visibility, but a 50-inch light bar is a bit too much bright-wise or budget-wise, then a 40 inch light bar may be your sweet spot. There is a lot to choose from in this category from single to double row bars that output from around 10,000 raw lumens up to 44,000. You also have plenty of beam pattern choices and mounting options, so take your pick and light up the trail like never before.